Get the bestselling book on living, leading, and working with authentic purpose + a 22-page purpose discovery workbook. Workbook includes five key exercises to begin learning a purposeful mindset and identifying purpose. The best leaders aren’t people. Instead, innovative and emerging research shows that a compelling and other-centered authentic purpose – the “invisible leader” – may be the most powerful influencer of our behaviors, attitudes, and organizations. 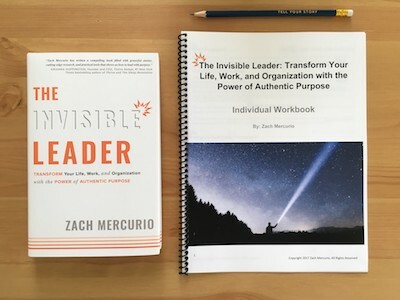 In this instructive webinar, author Zach Mercurio introduces a theory of “invisible leadership” and provides practical steps for leading with purpose to compel and inspire others. Participants will learn what “invisible leadership” is and why it works to compel and inspire others. "How to Awaken Purpose in Life & Work"
Studies have found that people who live, lead and work with purpose live up to 7 years longer, are 42% more likely to experience contentment in life and at work, and are four times more likely to be engaged in their jobs (Gallup, 2013; National Institutes of Health, 1998; New York University, 2015). In addition, organizations who have a strong sense of purpose are more profitable and outperform the market 6:1 (Deloitte, 2014). But what is purpose and how do we awaken it in both life and work? In this workshop Zach draws on his own personal experience of finding purpose, research on meaning and purpose in life and work, and professional experience working with individuals, college students, non-profits and Fortune 500 companies on awakening and aligning purpose. Participants will learn key strategies to awaken their own personal purpose, adopt a leadership style that compels and inspires people to deliver purpose, and craft their work and workplaces to be purpose-driven.